All manual changes to the Windows Registry can be completed via Registry Editor, a tool included in all versions of Windows. Registry Editor lets you view, create, and modify the registry keys and registry values that make up the entire Windows Registry. Unfortunately, there's no shortcut for the tool in the Start Menu or on the Apps screen, meaning you'll have to open Registry Editor by executing it from a command line. Don't worry, though, it's not at all hard to do. You can open Registry Editor this way in any version of Windows that utilizes the registry, including Windows 10, Windows 8, Windows 7, Windows Vista, and Windows XP. In Windows 10 or Windows 8.1, right-click or tap-and-hold the Start button and then choose Run. Prior to Windows 8.1, the Run dialog box is most easily available from the Apps screen. In Windows XP, click Start and then click Run. One quick way you can open the Run dialog box in any of these Windows versions is to use the keyboard shortcut WIN+R (hold down the Windows key and then press R once). Depending on your version of Windows, and how it's configured, you may see a User Account Control dialog box where you'll need to confirm that you want to open Registry Editor. If you've used Registry Editor before, it'll open up to the same location you were working in last time. If that happens, and you don't want to work with the keys or values at that location, just continue to minimize the registry keys until you've reached the top level, listing the various registry hives. You can minimize or expand registry keys by selecting the small > icon next to the key. In Windows XP, the + icon is used instead. You can now make whatever changes you need to make to the registry, which probably shouldn't be done unless you are versed in how to safely add, change, or delete registry keys and values. Make sure, whatever you do, that you only affect the narrow registry areas that you intend to. Considering the impact that the registry has on your Windows-based computer, we strongly recommend that you back up the registry, either the whole thing or even just the areas you're working in, before you do anything. It's important to know how to restore the Window's Registry before using Registry Editor. This lets you add a REG file backup into the registry should something go wrong during editing. Even though Registry Editor is open and ready to be used, it's not always wise to make changes yourself, manually, especially if a program or automated service can do it for you. For example, if you're using Registry Editor to clear up residual or junk registry entries, you shouldn't do it yourself unless you're very sure that you know what you're doing. Instead, use a free registry cleaner if you want to clear out common registry junk automatically. The same regedit command can be executed from Command Prompt. After opening Command Prompt, just type out the command and press Enter. 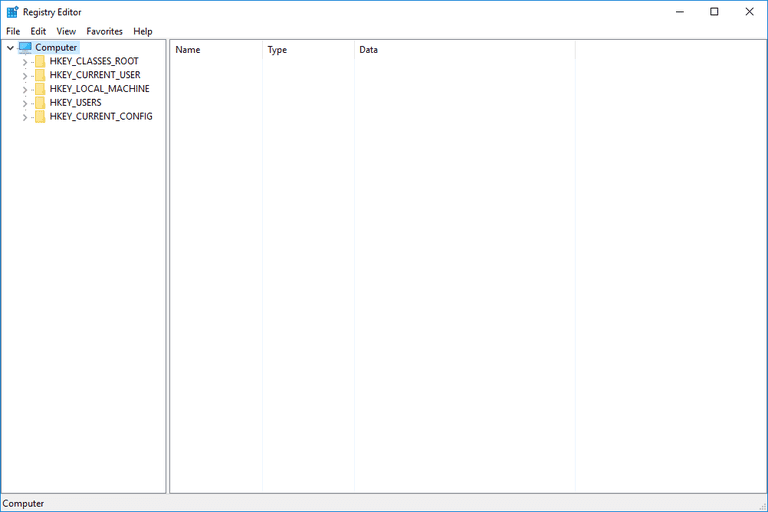 Although the circumstance would have to be rare, yet another way to launch Registry Editor is from Task Manager. To do that, open Task Manager via Ctrl+Shift+Esc, go to File > Run new task, and type regedit, followed by OK.
You might open Registry Editor from Task Manager if you can't access the standard Run dialog box as described in Step 1 above, or if Explorer or Command Prompt won't open for some reason. If you find yourself opening this tool often, you can make a Registry Editor shortcut on your desktop. Right-click the desktop, go to New > Shortcut, type regedit, and press Next and then Finish. In some versions of Windows, you can drag the shortcut onto your taskbar for even quicker access. Opening a remote Windows Registry is a bit different of a process than the one described above for a local registry. After opening a regular Registry Editor window, there's an additional step to find the remote registry.